Mama always told me "Be careful who you pal around with, for you will influence each other." So it would appear to have been for Joshua Bell. In fact, he redesigned his home in Manhattan specifically to accommodate his pals, the ones with whom he wanted to hang out with in between tours. And it has paid off, my friend, just released today: "At Home With Friends." Hanging around with pals like Josh Groban, Kristin Chenoweth, Anoushka Shankar, Chris Botti, Edgar Meyer, Frankie Moreno, Sting, and many more, Bell began having "musicales" in his home -- musicians sitting around jamming, playing, getting creative, pushing the envelope. "To me," claims Bell, "The home is a very special place." Here, here! Musicians everywhere, including my own home, have been sitting around jamming for years, that is indeed a very special place. Bell soon had the desire to share their creative endeavors with a wider audience. The good people at Sony were eager to jump on board and thus we have "At Home With Friends," an eclectic collection consisting of a broad genre of music including jazz, pop, broadway and, dare I say it, bluegrass. At Home With Friends changes genre with each track, causing jaw dropping moments where a new song comes on, I scrunch my eyes and gape, "Where'd that come from?!" I'm bouncing along doing the salsa with Jorge Gomez on track 5, Para Ti, when it ends abruptly and Kristin Chenowith begins a My Funny Valentine serenade. Bring on the flute, mi amore'! Alas, flutes are only featured on two tracks. Bell's violin skills are featured on each track while other tracks include clarinets, French horns, bassoons, harps, piano, sitar and various percussion instruments. At Home With Friends is a must for every record collection. Not big on classical music? Perfect. This stretches the definition of classical music with its undertones of pop, jazz and broadway. 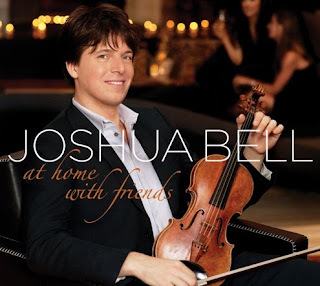 I was stunned by Joshua Bell and Frankie Moreno's arrangement of "Eleanor Rigby," an old Beatles song, it's amazing. Sting so eloquently sings in Come Again (track 2), "To see, to hear, to touch, to kiss, to die....." To which I added: to swoon. I think you just might swoon. is he paying u for this? No, should he be? Did you go out and buy one? Do you think the Varsity or Pie in the Sky (previous two posts) paid me?